Another year is about to end and what a great year it was. We can’t thank you enough for your continued support of WPBeginner. We look back at 2016 and feel grateful for the success and joy our team achieved. Wow what a year has this been for WPBeginner. Not only did we grow in all aspects from traffic to team size to revenue (coming from our premium plugins), but we also got a new site design after 4 long years. Our YouTube channel doubled in size. We now have over 500 free video tutorials that have been watched by over 6 million people, and we have almost 47,000 subscribers. I would really appreciate it if you can subscribe to our YouTube channel. My goal is to reach the 100,000 subscriber mark in 2017. This was also a great year for WPBeginner’s family of products. In March, we launched a new WordPress contact form plugin. It’s called WPForms, and we have both a free version and a premium Pro version. I wrote a full WPForms backstory about how and why we started WPForms on my personal blog. It’s a fun read. Our WordPress gallery plugin, Envira Gallery, doubled in size. We now have over 30 addons that makes Envira the most flexible and easy to use WordPress gallery plugin in the market. We did a major overhaul to our WordPress slider plugin, Soliloquy. Aside from the completely new website design, we also significantly optimized the plugin workflow and added several new addons. Our signature product, OptinMonster, continued to push the limits in 2016. Our team nearly doubled in size, and we have added tons of conversion optimization features such as dynamic text replacement, onsite retargeting, onsite follow up campaigns, and so much more. Seriously, if you’re not using OptinMonster, then you’re losing subscribers every day. Michael Stelzner from Social Media Examiner added 250,000 new email subscribers using OptinMonster (see the case study). We have a lot of exciting things coming up in 2017 including the revamp of MonsterInsights in January. If you want to keep up with more than just WPBeginner, then you can always follow me on Twitter (@syedbalkhi) where I tweet about our other projects, marketing tips, and tons of other cool things. 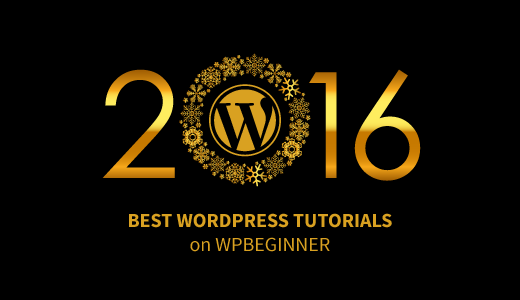 Now let’s take a look at the best of WPBeginner in 2016. In 2016, we wrote tons of useful WordPress tutorials. Here’s a hand-picked list of some of our favorite ones. Who owns WordPress? And how does WordPress make money? – Many beginners often find it difficult to understand how open source software work. In this article, we answered the most frequently asked questions about who owns WordPress and how it makes money. How to install Facebook remarketing/ retargeting pixel in WordPress – Facebook retargeting pixel allows you to track your website visitors on Facebook and show them ads. It helps you boost conversions and get more user engagement on your Facebook page as well. Which is the best WordPress Popup Plugin? – We compared the performance and quality of best popup plugins for WordPress. We tested each of them for speed, features, ease of use, and pricing to find out which one is the best solution. 4 Ways to Prevent Image Theft in WordPress – Image theft is a common problem for photographers and bloggers. We shared 4 ways to prevent image theft on a WordPress powered website. While there’s no way to completely stop people from stealing your images, these ways help reduce image theft. WordPress vs static HTML – What’s best for your business website? – We are often asked by business owners about the advantage of using WordPress over static HTML website. In this article, we compared pros and cons of WordPress vs static HTML. 36 Reasons Why Having a “Free Website” is a Bad Idea – The thought of getting a free website is tempting. But there’s always a catch. We shared 36 reasons why having a free website is a bad idea and something you should AVOID at all costs. How to Make a Niche Review Site in WordPress like a Pro – Want to create an online review site? We created a step by step guide on how to create a niche review site in WordPress like a Pro, so you can earn money from it. How to Add an Author Bio Box in WordPress Posts – An easy way to add an author bio box with their social profile links at the end of each post. We shared 3 different methods, so you can choose the one that best suits your need. How to setup a professional email address with Google Apps and Gmail – The first thing every business owner needs is a professional email address. We walked you through a step by step guide on how to create a professional email address the RIGHT way. How to properly move from Squarespace to WordPress – Many users start their websites using different platforms like Squarespace. Sooner they realize the limitations and find WordPress as the more flexible solution for their needs. In this article, we showed you how to properly move your website from Squarespace to WordPress. How Sucuri helped us block 450,000 WordPress attacks – We use Sucuri to improve security of all our websites. In this article, we shared our case study and how Sucuri helped us improve WordPress security. How to Send Thank You Email to Blog Commenters in WordPress – One of the best ways to engage users and keep them coming back after they leave a comment on your site. A simple thank you email goes a long way. How to Add Facebook Like Emotional Reactions in WordPress – You’re probably familiar with the emotional reactions that Facebook added earlier this year. Well, you can add a similar feature on your blog posts to boost engagement. 5 Best WordPress eCommerce plugins compared – Many of our users asked us about which eCommerce plugin they should use. In this article, we compared 5 best WordPress eCommerce plugins with pros and cons. 19 Actionable Tips to Drive Traffic to Your New WordPress Site – Ever wondered how can I get more traffic to my website? This article covers 19 different ways to increasing your traffic. How to Add Google Search in a WordPress Site – We use the Google search on our website. This article shows you how to replace the default WordPress search with Google search for more relevant results. How to Fix WordPress Not Sending Email Issue – Most WordPress hosting servers aren’t properly configured to send emails. This is quite frustrating because you might miss an important contact form inquiry or another email. You can fix this problem by following this tutorial. How to setup Facebook Instant Articles for WordPress – In this step by step tutorial, we explained pros and cons of Facebook Instant Articles as well as how to easily set it up on your WordPRess site. Yoast SEO vs All in One SEO Pack – Which is the best WordPress SEO plugin? – In this article, we compared two of the most popular WordPress SEO plugins to find out which one is the best. 5 Best WordPress membership plugins – Want to build a membership website with WordPress? We compared the best WordPress membership plugins to find out which one offers the most features, flexibility, and ease of use. How to Highlight New Posts for Returning Visitors in WordPress – Ever wondered how popular sites highlight new posts for returning visitors? Here’s an easy way to highlight unread WordPress posts to returning visitors. How to create a multilingual WordPress site with WPML – Want to build a multilingual website? In this article, we showed you how to easily build a multilingual WordPress site with WPML. How to create a multi-page form in WordPress – Multi-page forms allow you to make lengthy forms much easier to fill. In this article, we showed you how to easily create multi-page forms in WordPress. How to better manage automatic WordPress updates – Updates are important for security and stability of your WordPress site. However, if you manage multiple WordPress sites then updates can become a bit annoying. In this article, we showed you how to better manage automatic WordPress updates. 15 Most Annoying Things about WordPress and How to Fix Them – Like most things in life, WordPress also has it’s fair share of annoying things. We shared 15 most annoying things about WordPress and how to fix them. 16 Best WordPress plugins for marketers – We are often asked by users about plugins they should use to market their website and products more effectively. In this article, we hand-picked some of the best WordPress plugins for marketers that can help you reach new customers and boost sales. 10 Awesome WordPress Features that You Probably Didn’t Know Existed – WordPress is always evolving and changing. We highlighted 10 hidden features that you probably didn’t know existed. How to Create Bars and Charts in WordPress with Visualizer – Easiest way to create graphs, bars, pie charts, and more in WordPress without writing a single line of code. Beginner’s guide to troubleshooting WordPress errors (step by step) – Many beginners often find it difficult to figure out what’s causing an error on their WordPress site. In this guide, we compiled a step by step list of actions to troubleshoot WordPress errors and fixing them. How to add web push notification to your WordPress site – Have you noticed the web push notifications used on popular websites like Facebook? In this article, we showed you how to easily add web push notifications to your WordPress site. How to Add a Reading Progress Bar in WordPress – Have you noticed how some popular sites show a reading progress bar indicator at the top of their articles? Here’s how you can add one on your site as well. 12 Tips to Optimize Your WordPress RSS Feed – Make the most out of your WordPress RSS feed with these 12 tricks. How to create a custom user registration form in WordPress – Want to allow users to register on your WordPress site without visiting the WordPress admin area? In this article, we showed you how to easily create custom user registration forms in WordPress. 25 Most Common WordPress Errors and How to Fix Them – When you see a WordPress error, don’t panic. Simply refer to this guide where we cover how to fix the 25 most common WordPress errors. Why Building Your Email List is so Important Today – Often bloggers and business owners ignore this subject, but they shouldn’t. We cover the top reasons why building an email list is crucial for your success. How to properly update live published posts in WordPress – Editing a live published post means you will have to finish the work in one go. You cannot save the changes mid-way. In this article, we showed you how to properly update live published posts in WordPress. How to start your own podcast (step by step) – Want to start your own podcast using WordPress? In this step by step guide we showed you how to start your own podcast like a pro. How to start an online store (step by step) – Want to start your own online store using WordPress? In this step by step guide, we showed you how to start an online store in 2016 and start selling. The Ultimate WordPress Security Guide – WordPress security is a topic of huge importance for every website owner. In this guide, we covered all the top WordPress security tips to help you protect your website against hackers and malware. Ultimate WordPress SEO Guide for Beginners – Improving your WordPress SEO is crucial for getting more traffic to your website. In this guide, we shared the top WordPress SEO tips to help you improve your WordPress SEO and get more organic traffic. How to allow users to submit posts to your WordPress site – Want to accept articles and guest posts from users on your site? In this article, we showed you how to easily allow users to submit posts to your WordPress site. The Ultimate Guide to Boost WordPress Speed & Performance – Speed not only improves user experience on your website, it also helps you rank higher in search results. In this guide, we showed you how to improve WordPress performance and speed. 16 tools to create better images for your blog posts – Want to add beautiful images to your blog posts but don’t have graphic design skills? In this article, we hand-picked the best tools to create better images for your blog posts without any design skills. How to Choose the Best Blogging Platform (Comparison) – We compared the top 10 most popular blogging platforms to help you decide which is the best one. You can take a guess which one won. 15 best tutorials to master WordPress navigation menus – We compiled a list of all the best tutorials to help you master WordPress navigation menus like a pro. How to Move WordPress to a New Host or Server with no Downtime – Looking to switch hosting providers? HEre’s a step by step guide on how to properly migrate your site without downtime. How to Setup Google AMP in WordPress – Step by step guide on how to properly setup Google AMP on your WordPress site. 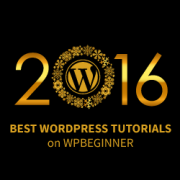 These were some of the best WordPress tutorials on WPBeginner in 2016. We hope that you liked them. We would like to thank all our users for supporting us by offering feedback, sharing our articles, leaving comments, and suggesting topic ideas. We are really very thankful. We hope to add even more useful tutorials in 2017. Really, I just wanted to wish you well, and congratulate you on the service you have grown – and your beautiful family as well. How wonderful to have Solomon close by! Best site for launching new website or blog. This site have complete end to end support in every aspects for site. Very much appreciated. Thanks for all you do Mr. Balkhi…Happy New Year and all the best to you and your beautiful wife and awesome baby boy…All the best in the coming year. Just a short note to let you know that you work is very precious and inspiring for a lot of us career changing types. You’ve made working on my WP site most digestible. Cheers you lovely man! Happy to see this post Syed. I have already read most of the tutorials listed out here. Thanks for all the good tips. Congrats on the business successes and especially on the baby boy. Keep up the good work. Thanks for always providing such useful and easy to understand tips on WordPress. Thank you so much for this!! And Congratulations on that beautiful baby boy! Thank you! I subscribe to your newsletter, but this list is a great reminder for me to go through my site and decide what to add or delete to make it better for the new year. You had an amazing year! Needless to say I have been following WPBeginner since the day I migrated from blogger to WP and you as an ideal from a couple of months. Loved your inspiring journey and your constant thriving to update and make your products better. I wish you an even more awesome year 2017, professionally and personally. As always you have the best tutorials and we are always glad to come back when we have some doubts. Stay the best and be better in 2017. Have a great New Year. Cheers! I use to follow WPBeginner since a long time. And yes, congratulations for Solomon. Congratulations on your beautiful baby. I am a blogspot blogger but i read your every post. These articles are really helpful! I just shared this one on Facebook. I appreciate you helping so much, you have helped me a great deal! Congratulations on your beautiful baby boy. They are a blessing. And what a beautiful name too. What a a joy to be here ag. What an eventful year just passing by. 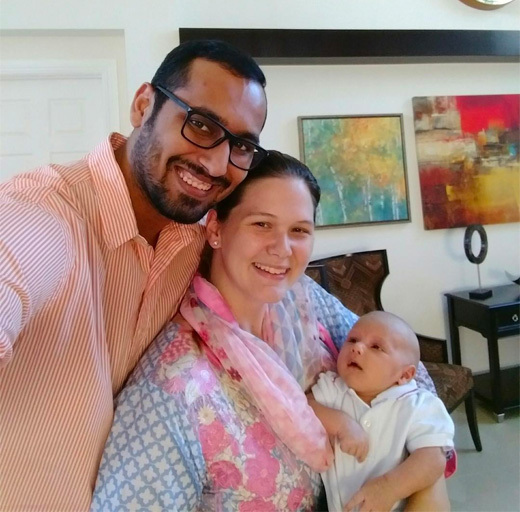 Happy to see your lovely family pic with little Solomon. Indeed Sol is a cute little one. May God bless him. This post is indeed a collectors item to preserve and refer every now and then. 2016 is no doubt an information packed eventful year indeed. Wish you and your team yet another eventful year of 2017. Thanks for this Syed. A great resource all in one article.